Feminist Gift SOCK Set. 3 Pairs of Fun Socks with We Can Do It! Message. Pair Rosies-Pair Rock Your Dots-Pair Hearts. For the empowered woman on your gift list, check out our Sock Gift Set. Scroll down to learn how these THREE pairs of socks can become SIX pairs. • We started with the patriotic blue from Rosie the Riveter's shirt in the We Can Do It! poster. This became the background color. • We added yellow hearts, the same color in the backdrop of the We Can Do It! poster. • But wait, we included one yellow silhouette of Rosie hiding in plain sight among the hearts. • And the bottom of the sock? We couldn't resist. We added the words, WE CAN DO IT! Stretch your legs out and everyone will see the empowerment message. • The toes, heels, and top cuff are our Rosie the Riveter red. The cuff repeats the word Hearts all around. 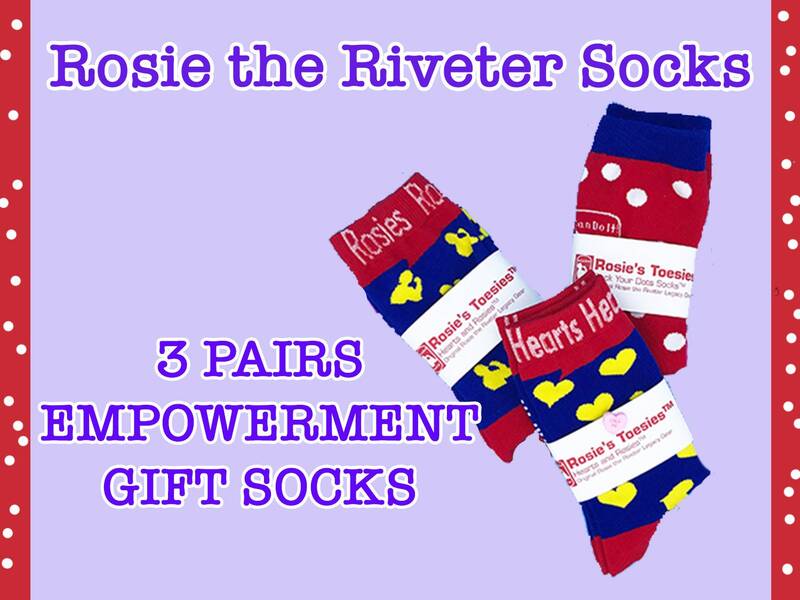 • As with the Hearts socks, we began with the patriotic blue from Rosie the Riveter's shirt in the We Can Do It! poster. This is the background color. • We added silhouettes of Rosie the Riveter in the same yellow you find in the backdrop of the We Can Do It! poster. • We included one yellow heart hiding in plain sight among the silhouettes of Rosie. • And the bottom of the sock? Once again, we added the words from the Rosie poster -- WE CAN DO IT! It's fun to show off the bottom of your socks. • The toes, heels, and top cuff are our Rosie the Riveter red. The cuff repeats the word Rosies all around. • Added Rosie's iconic silhouette on the back of the sock. • Placed the motto "We Can Do It! Pass It On!" under the silhouette. This is our reminder that it's the job and privilege of every woman to pass on Rosie's legacy of strength, courage, and empowerment to friends and future generations. • Then we topped off the look with a little patriotic blue--heel, toe and top. The shade of blue, of course, is taken from Rosie's shirt. Individually, these socks are $12.97 making the three pairs a $38.91 value. For our special Gift Set, we have priced these at $29.97 AND put them in a cute organza bag at no additional cost. You save $8.94! and have a lovely gift. Lose a sock in the laundry? Don't worry. You can just mix and match the remaining socks. Rosie the Riveter socks make a special gift, packaged in a lovely white organza bag. SPECIAL OFFER: This pin is $7.97, but as an add-on, you can have it for just $5.97. A sweet deal. Today, we want to help everyone show that they STAND WITH WOMEN. We offer enamel pins with messages of empowerment and strength and t-shirts with messages from women in history. If there are products you would like, please convo us. We love the ideas from our customers. After publication, we received so much interest from women who wanted to write their own life stories that we began teaching and coaching memoir writing. Eventually, we wrote about our new approach in what began the award-winning book WRITING ALCHEMY: How to Write Fast and Deep. Over time, we added a number of products including THE [ESSENTIAL] WOMEN’S MEMOIR WRITING WORKSHOP — 21 Video Lessons; MARKET. PUBLISH. WRITE. — 9 Instructional Videos with more than 10 hours of coaching and how to material; STORYMAP: The Neverending Writing Prompt; and numerous additional gift products designed for women interested in writing about their lives. Soft Lap Blanket / Fleece Throw Gift for Woman with Optional Red and White Polkadot Mug and Polka Dot Socks. Rosie the Riveter Inspired. Empowered Women Gift SOCK Set. 2 Pairs--New Designs. Fun Feminist Socks with We Can Do It! Message. Rosie the Riveter Inspired Socks. Gift SOCKS. Fun and Fashionable Soft, Comfortable Red Socks with White Polkadots. Rosie the Riveter Polka Dots. Socks for Empowered Women. RosieMade Lip Balm Gift Set. Organic. Handmade. Soothing Lip Balms. Love Your Lips. Penny Candy Collection. Rosie the Riveter Inspired. Arrived promptly in a bright cheerful packing envelope, which was a 'make me smile' moment on a grey rainy miserable day. The socks themselves are colorful and match the picture exactly. A perfect fit. Win - win- win!